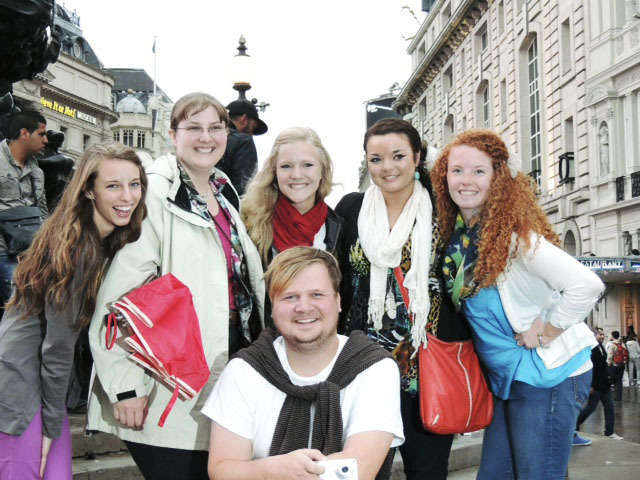 The Study Abroad Program at the University of West Georgia has taken thirteen students to France and England over the summer. A couple of students from UWG have shared their journey. The trip to France and England was for 18 days, including travel. While in France, UWG students were able to visit the region of Normandy, as well as the Bayeux. In Paris, students visited Versailles and various sites such as the Arch de Triumph, the Louvre and other art museums. Students also travelled to London by train where they stayed for four days and visited different sites like the British Museum, the Westminster Abbey, the Tower of London, the National Gallery and the Tate Modern. This summer’s study abroad trip was the first time for many students to have travelled and admire new scenery outside of the United States. “Before this trip I had never even flown in an airplane or been out of the United States. In fact, I can’t wait to travel abroad again after my experience with this trip because I want to go back and see the places we didn’t have time to visit,” said senior Lauren Koch. Students were able to see sizes of different architecture while standing within feet of some of the most famous works of art in history. Students were exposed to many great works of art, cathedrals and museums constructed three to four hundred years ago. “It was really shocking to see a picture in a book and then see it in person.” said senior Michael Louis Le Blanc. “The experience was unbelievable.” Students tried different foods like the Kabbas, which is a French version of a gyro. “It’s the most delicious meal, and for the most part affordable when other things were expensive,” said Le Blanc. Students confessed that they had experienced a few challenges even though the majority of their study abroad experience was fun. “I got lost the first night in Paris. I had no map, no cell phone, and no address but I somehow found my way back home by landmarks,” said Le Blanc. The University of West Georgia’s Study Abroad Program encourages students to take advantage of the opportunity to travel out of the country. “I suggest every major, especially art majors, should study abroad. Save money, get of out Carrollton and experience a different culture,” said Le Blanc. The Study Abroad Program is open to all majors. Students should consider financial aid and other scholarships to help make their trip a little more approachable. Furthermore, studying abroad helps students develop skills that will make them look more appealing to their employers after graduation.